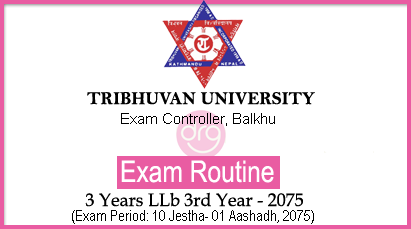 Today, 23 April, 2018 [10 Baishakh, 2075] Tribhuvan University (TU), Exam Controller Office, Balkhu has published a notice regarding the exam routine for 3 years LLb 3rd Year 2075. Note: If you have failed to submit the exam application form, you can submit the form in your respective campuses paying double fee and such campuses have to submit the collected examination form to examination controller office within 19 Baisakh, 2075 [2 May, 2018]. See below the Exam Schedule for 3 Years LLb 3rd Year 2075. 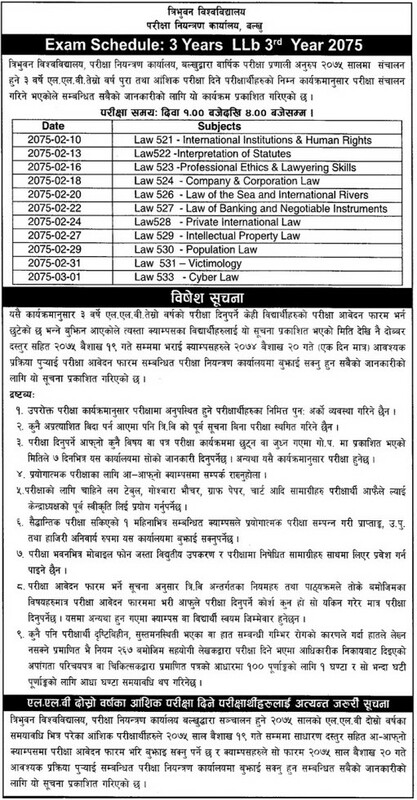 0 Response to "Routine Of 3 Years LLb 3rd Year Exam 2075 | TU"